The 18 selected electricity, smart grids and gas projects will contribute to achieving the Energy Union's goals by connecting European energy networks, increasing security of energy supply, and contributing to the sustainable development by integrating renewable energy sources across the EU. The Energy Union strategy has at its centre the transition to a low-carbon, and secure and competitive economy. Properly interconnected electricity lines and gas pipelines form the backbone of an integrated European energy market. Investing in sustainable and renewable energy sources helps accelerate the energy transformation in Europe and ensures that such a transformation is used for the EU industry to reach a leading position in low-carbon technologies, thereby fostering green growth and jobs – all priorities of the Juncker Commission. The money for the chosen projects comes from the Connecting Europe Facility (CEF), the EU's funding support programme for infrastructure. Commission Vice-President for Energy Union Maroš Šefčovič said: "I welcome today's agreement by the Member States. These are important projects with major cross-border implications. They are a tangible sign of what the Energy Union means for Europe and how the European Union can help making our countries stronger by cooperating closely together." Commissioner for Climate Action and Energy Miguel Arias Cañete said: "This is another milestone in the setup of a cleaner, more competitive European energy market. An energy infrastructure which is fit for purpose is essential for renewables to thrive. Thanks to this upgrade, the proposals in the Clean Energy for All Europeans package are even closer to become a reality. The EU is demonstrating its commitment to delivering cheaper, more sustainable and secure energy to European consumers". 7 are in the electricity sector (EU support €176 million), 10 in the gas sector (EU support €228 million) and 1 for smart grid (EU support €40 million). 5 relate to construction works (EU support €350 million) and 13 to studies (EU support €94 million). In the electricity sector, a grant will support the implementation of Germany's largest energy infrastructure project in its preparation phase: the SuedLink project (EU support €40.25 million). It is the first project of this kind on such a large scale: 700 kilometres of high voltage cables due to be laid fully underground. 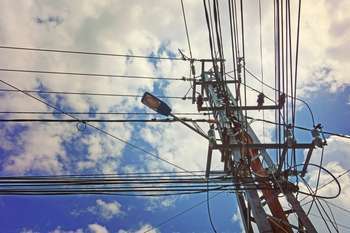 The power line will create an urgently needed link between the wind power generated in the north and the consumer centres in the south of Germany. It will ensure better integration of renewable energies and it will also further enhance the cross-border exchange of energy with other EU Member States. A €90 million EU grant will support the implementation of an innovative energy storage project, the compressed air energy storage (CAES) in Larne, Northern Ireland. This project uses excess energy when for example renewable generation is abundant, into compressed air which is then stored in geological caverns within salt layers deep underground, for later release to generate electricity. The project will contribute to system flexibility and stability and facilitate the large-scale penetration of renewables into energy markets. In the gas sector, Connecting Europe Facility will support the construction of an off-shore LNG terminal on the Croatian island of Krk (EU support €102 million) which will bring diversification in the region mostly dominated by one single source of supply. It will thus improve energy security and price competitiveness in the region. Furthermore, a smart grid project (SINCROGRID project) that will lead to more efficient use of the existing electricity transmission grid in both Slovenia and Croatia will receive financial support (of €40 million). This will enable current infrastructure to cope with the uptake of additional renewable energy and result in greater energy security without the need to build new overhead cables.